Recent comments and inquiries about my Burke family research have reminded me that I do have a couple of additional pieces of information to add to the Burke family story. In a previous post, I mentioned that I believed that I had found the brother of my g-g-g-grandfather David Burk. I believe that David and his siblings came to Canada during the late 1840s at the time of the Irish potato famine. David Burk settled in Mariposa Township in Victoria County, Ontario. Oral family history has it that David had a brother Richard and a brother Joseph. I believe that David’s brother Richard moved to Carievale, Saskatchewan. I outline my reasons for making this connection in my previous post. I have yet to locate David’s brother Joseph. In the meantime, however, I have some additional information about David Burk. This new information adds more circumstantial evidence that David Burk and Richard Burke are brothers. David Burk; Con: 2 W 1/2; Lot: 20; Acres: 100; Value of each parcel or lot: 75; Value of horses: 30; No of neat cattle, 3 years or upwards: 2; Number of neat cattle: 6; Total value of taxable personal property: 36; Statute labour: 6. Records weren’t available as they discovered mold on the folders. David Burk; Age 28; Farmer; Householder; Con 2, Lot 20 W 1/2; Value of lot: 300. No other info. Occupant: David Burke; Occupation: Yeoman; Householder; Age: 28; Concession 2; Lot 22 1/2 N; No. of Acres: 100; Value of each lot: 40; Total value of property: 40; Statute Labour, No of days: 2. I also checked if David Burk was perhaps the original patent holder for the land on Con 2 Lot 20. He wasn’t. The original patent for Con 2 Lot 20 1/2 W for Mariposa Township, Victoria County went to John Ray in 1843, George Ray in 1844, and to John Naylor 1853 and 1854. This suggests that David Burk was renting this land — a fact which is confirmed by the fact that he has moved to Con 2, Lot 22 by 1854. The 1861 census has him living on Con 2, Lot 21. If there were other Burk siblings living on this land and helping (and I suspect that there were), they were younger than David because he is listed as the head of the household. It gives us some pretty interesting information about the farm: 6 neat cattle! It gives us some additional information about David’s age. The 1861 census puts his date of birth at 1824, but according to this new information, it could have been a couple years later in 1826. Of course, none of this ties David Burk to Richard Burke. What I also discovered, however, was that David Burk was living next to several Shouldice families in 1851-4: those of Jacob, William, John and Samuel. Richard Burke’s wife was Mary Ann Shouldice. Moreover, Mary Ann Shouldice is buried in North Valentia United Cemetery which is only one concession over from David Burk’s farm in Mariposa Township. (Mary Ann died of puerperal peritonitis (infection after childbirth) three days after the birth of her son Frederick Whitlock Burke in 1873 – see the death record to the left). 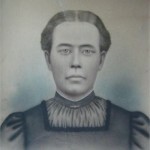 It is seems probable that Mary Ann Shouldice was related to the Shouldice family who lived next to David Burk and that Richard had met Mary Ann through this connection. (I suspect that Richard was living on David’s farm). Perhaps Mary Ann was the daughter of Jacob Shouldice who was born 1796 in Ireland and who died in 1882 in Lindsay in Victoria County. This would fit as Jacob is the name of Richard and Mary Ann’s first son. Interestingly, Jacob Shouldice is listed as Bible Christian in his death record. 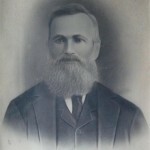 David Burk’s son Benjamin (my great-great grandfather) married into the Puley family who were also Bible Christians. So again, this isn’t definite proof that Richard and David were brothers, but at this point I would be very surprised if they weren’t. P.S. Someone named Frances left a comment on my previous post that she was a descendant of Richard Burke and knew that he had 12 siblings. Frances — I tried to contact you at the e-mail you left, however, my e-mail bounced. I’d love to hear more about what you know. You can write me directly at twigg3d@gmail.com! Who was Mary Ann Shouldice? As I was researching the connection between the families of David and Richard Burk(e) something stood out for me. Richard Burke’s wife Mary Ann Shouldice died in 1873 after the birth of her son Frederick Whitlock. Richard Burke was left to raise 10 children by himself. Normally, a widower with children would remarry. Richard never did, and there is a grave marker for Mary Ann in Saskatchewan where Richard buried. A drawing of Mary Ann (likely based on a photograph) has been passed down to descendants. This gives me the sense that this was a woman who was well-loved and desperately missed. But who was Mary Ann? Who were her parents? In a previous post, I speculated that Mary Ann was the daughter of Jacob Shouldice and Elizabeth Bradley. I now have some additional evidence that this is the case. 1) David Burk and Jacob Shouldice were neighbours. As I mentioned in my previous post, Jacob Shouldice and David Burk (Mary Ann’s brother-in-law) were neighbours in Mariposa Township, Victoria County. The 1851(2) census records for Mariposa Township have not survived, but the Archives of Ontario hold the Assessment Rolls and Tax Collectors rolls for the early 1850s. The 1853 Assessment Roll is particularly useful because it contains the ages and occupations of the inhabitants of the township. The name of her eldest son is Jacob George, likely after Jacob Shouldice. Another researcher pointed out to me that John Shouldice might be her father. He is living with Richard and Mary Ann Burke in the 1861 census. He is the right age to be Mary Ann’s father. However, I think that this John is actually Mary Ann’s cousin. He is listed as crippled in the 1861 and this information makes me believe that he is likely the handicapped son of Adam Shouldice who settled in Harvey Township in 1825 as part of the Peter Robinson immigration scheme. None of Mary Ann and Richard’s children are named John which would be likely if he were her father. 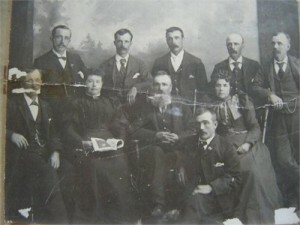 Mary Ann’s youngest son Fred W. Burke is living with Elizabeth Shouldice Reekie in Duluth, Minnesota in 1895 and later with his own family in 1920. Elizabeth’s marriage certificate to James D Reekie lists her parents as Jacob Shouldice and Elizabeth Bradley, and there is a copy of her baptismal record in the Valentia Bible Christian Church in Mariposa Township. A written Burke family history recounts that Fred Burke stayed with an aunt in the US after his mother’s death. I think that Jacob and Elizabeth had a daughter Catherine who married Thomas Forest. In 1861, there is a M.A. Forest living with Richard Burk and Mary Ann Shouldice, born around 1854, who is listed as a niece. This is Mary Ann Forest, who, on her marriage certificate, lists her parents as Thomas Forest and Catherine Shouldice. Also in 1861, there is a C. Forest, age 1, living with Jacob and Elizabeth Shouldice. This census also lists a C. Shouldice and an E. Shouldice living with Jacob and Elizabeth. I believe that this is a census taker’s error and that this is C. Forest (née Shouldice), and her daughter Elizabeth Forest. The ages of Catherine and Elizabeth align with 1871 census results for the Forest family. There is a baptismal record for a Catherine Forest at the Valentia Bible Christian Church born 15 Nov 1860 to Catherine and Thomas Forest. Catherine Forest’s family and Elizabeth Reekie’s family are also linked. Catherine’s grandson Herbert is living with Elizabeth in 1900 US census. Catherine’s daughter Elizabeth Forest Maunder was also living with Elizabeth in 1930 US census. I believe that this is good evidence that Elizabeth Shouldice Reekie and Catherine Shouldice Forest are Mary Ann’s sisters. Elizabeth Shouldice Reekie’s parents are clearly listed on her marriage certificate as Jacob Shouldice and Elizabeth Bradley. 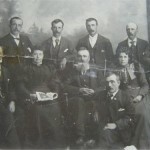 Abe, Bill and David Shouldice, sons of William Shouldice (1831-1908) and Elizabeth Irwin (1838-1918), are identified as cousins by the family of Richard Burke in a written history of Gainsborough, SK. This would make William Shouldice Mary Ann’s brother. There is further evidence that this is the case. William Shouldice (1831-1908) lists his year of immigration as 1834 in the 1901 census. Mary Ann Shouldice lists her place of birth around 1834 as “at sea” on the 1871 census. This William also has a son named Jacob who dies as an infant. In my next post, I’ll add some additional information about the Shouldice family. Finding David Burk also meant finding another branch of this family who had also done extensive research and had perserved some oral family history. These cousins added some important information to the search, information which they pulled together in this biography of David Burk. The key information in this piece was that David Burk had (at least) two brothers–Richard and Joseph–and that one of these brothers had married a Catholic woman, was estranged from the family and moved west; and the other had had lots of children and had moved to Australia. I thought that my best chance of finding out more about David Burk was to find his siblings. First I had to do some grunt work. I wanted to make sure that I knew all I could about what happened to David Burk and Elizabeth Pogue’s children. I started tracing their lives through the Canadian censuses. In 1901, I found the three younger Burk siblings (Margaret, Cordelia and Joseph) all living close to each other in Carivale, Saskatchewan. They had clearly moved west when land on the Prairies became available. When I pulled up the original images of the census returns, I noticed something. Living close to David Burk’s children and their families were some other families named Burke, including one Richard Burke, born in 1836 in Ireland. 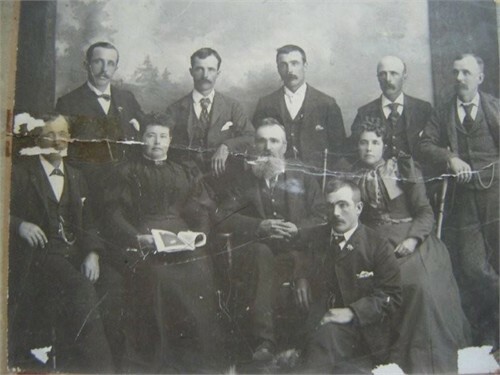 Richard’s descendants had done a lot of work tracing their side of the familyand I very quickly learned that Richard and his family had also settled in Mariposa Township, Victoria County, Ontario before they moved west in 1885. Even though the details don’t quite match the oral family history in my side of the family, they are close enough. I was certain that this Richard Burke was David’s brother. I was very quickly able to find descendants of Richard online (I love meeting new cousins), and I was very happy to hear that this branch of the family had been quite fastidious about keeping their family history. They knew, for instance, that Richard came from County Monaghan in Ireland. Richard’s grandson Delmer Smith Burke even wrote a lengthy year-by-year account of his life in Carievale. 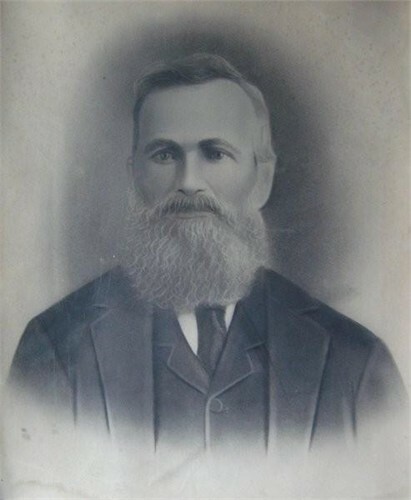 In this family history, he mentions that on the way west in 1881, his father Jacob George Burke stayed with his uncle David Graham and that David’s wife was his aunt, a sister to his father Richard Burke. This is music to a genealogist’s ear. Sure enough, I was able to find a marriage record for an Esther Burke and a David Graham. Esther was a resident of Mariposa Township when she married David Graham in Cobourg, Ontario in 1859. But the best news was that their marriage record named Esther’s parents: Benjamin and Jane Burk(e). I had not had these names before, but they do fit perfectly as both David and Richard had a son named Benjamin–not a common Irish name. Both families settled about the same time in Mariposa Township, Victoria County, Ontario. (In the absence of the 1852 census returns, I’ll have to check land records for the township, but I’m guessing that these families also lived close to each other in Mariposa). David’s descendants remembered a brother Richard and Richard’s descendants remembered a brother David. There were seven families living next to each other in Carievale in 1901: three children of David Burke, Richard Burke and four of his children. It is highly unlikely that this is a coincidence. (See the list below). The names Benjamin and Jane (the parents listed on Esther’s marriage certificate) are repeated in both families. There are still some things that I would like to figure out. It seems likely that the Burke siblings came to Canada during the Irish potato famine between 1845 and 1852. About 100,000 immigrants came to Canada in 1847 alone; 60,000 of them were Irish. Did the siblings come together or at different times? Did the parents also perhaps come to Canada and die before 1867 when deaths were recorded regularly in Ontario? There is a large age gap between David (b. 1824) and Richard (b. 1836) and Esther (b. 1839). This would suggest to me more than just one additional sibling. Did these siblings also come to Canada? Where are they? Were they also in Mariposa Township? If Richard wasn’t the brother to move to Australia, was Joseph? Tracing this family back to Ireland seems daunting, but I’d love to try….